One of the more uncomfortable social exchanges I have with folks is when I am thanked for my past military service, which seems relatively popular these days given the two conflicts we are embroiled in, in the Middle East. 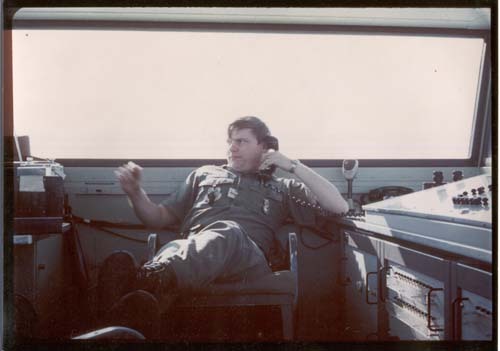 Me on duty.. Iceland (we used Navy vehicles). I mean, given my service was during the Vietnam War years, it seems a bit of a contrast being thanked not only for something I did nearly 40 years ago now but being thanked at all given it was a kind of “thankless” war in general. Even by today’s standards, we had no “mission accomplished”, no successful nation-building, and a most vocal 50% of the public were so against the war to the point that the military itself, average GI’s, were demonized as baby killers. But to make this all perfectly clear, I was never in Vietnam hence I am not a Vietnam Veteran… rather a Vietnam Era Veteran. According to the Veteran’s Administration, to claim “era” status I would have had to serve in any branch of the military prior to May 7, 1975. 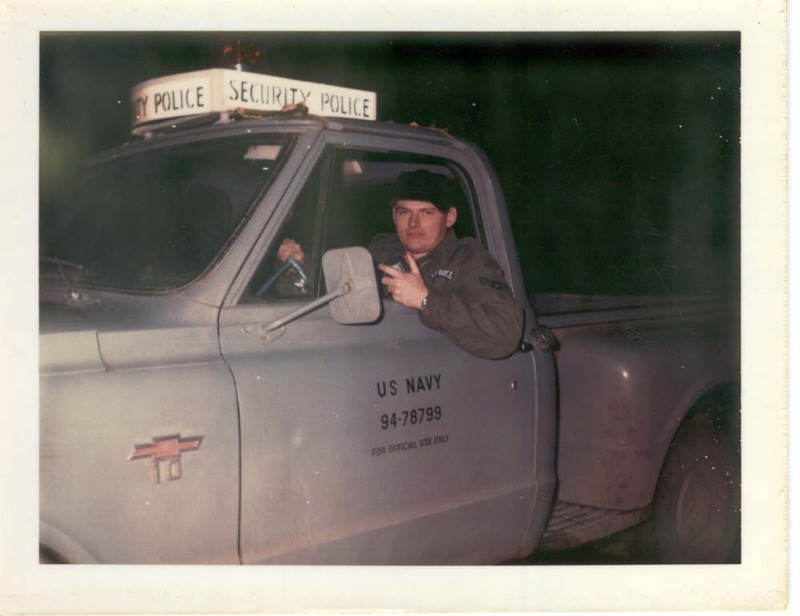 My service was from February, 1971 to January, 1975. So I qualify for “era” status. I don’t know if that gets me anything extra, but I do recall for a few years after my separation when I would visit various state or federal offices for one thing or another (like unemployment or DMV) veterans went to the head of any line. That doesn’t happen anymore. The strange thing is… I am generally humbled being in the presence of other veterans… especially those who have served in combat or were involved in combat support activites that put them in harm’s way (like Iraq and Afghanistan). I wanted to enter the military but was rather reluctant because of school. I kept my student deferment status (the draft was alive and well) for another year after graduation from high school while I went to college. But then I decided to take the plunge as I became disenchanted with continued schooling. After my freshman year in college I left academia and surrendered myself to the fate of the gods and the military draft. Me on duty in Iceland using absentee ballot to vote for Nixon. 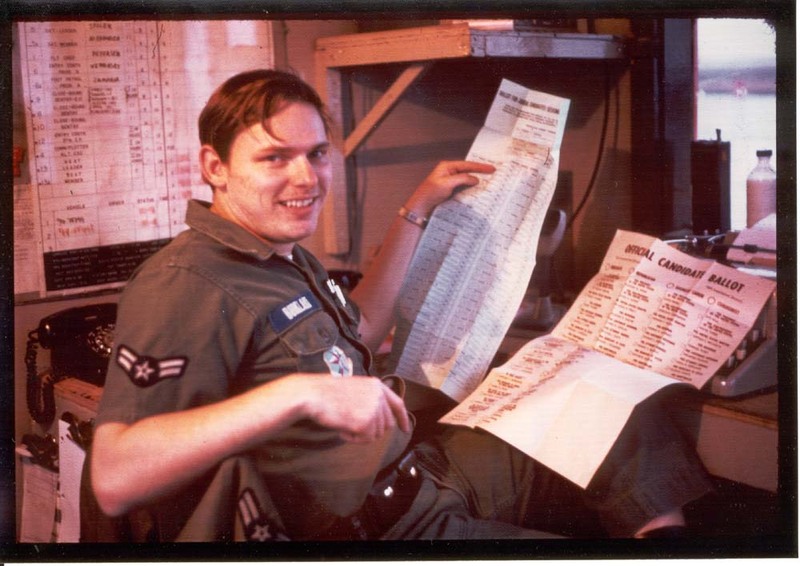 It wasn’t too long after leaving college that my draft number (based on my birth date in a lottery drawing) was called, number 53, which assured my enlistment in the Army was to take place by March of 1971. The war was still going on although so were the so-called peace talks and U.S. involvement was waning in favor of “Vietnamization” (turning the battle over to the South Vietnamese military). In fact, KIA’s for 1971 totaled 2,357; 1970, the year before, was 6,081 and the year after, 1972, was a dramatic reduction to 641. So my chances of going to Nam were pretty slim. In any event, I was reluctant about going into the Army for fear that I’d end up learning a combat job I’d not be able to use when I got out. So I enlisted in the Air Force before I was formally called up to report to the Army. I should mention a little more about the idea of “Vietnamization” here. Nixon and his staff came up with the idea… read this carefully… “Vietnamization” had two components. The first was “strengthening the armed force of the South Vietnamese in numbers, equipment, leadership and combat skills. The second component is the extension of the pacification program in South Vietnam.” Sound familiar? As I keep saying, what goes around can come around again.. and history can repeat itself if you live long enough to witness it. In a way I missed having had the opportunity of at least seeing for myself what the war of my generation was all about. But like everyone else in America I was limited to Walter Cronkite and The Huntley-Brinkley Report on TV. But, yes, I did serve, albeit in safe areas. My overseas assignment was of all places, Iceland (assigned to the Air Force detachment at the NATO base run by the U.S. Navy). As the years progressed after my separation from active duty I got wrapped up in life.. a family, raising three kids… three businesses. One thing has led to the other.. and I now find myself requiring the services of the VA for my medical needs. I am 61 as I write this so when I go into the various waiting rooms I find most other vets are my age or older. I listen to the others talk of their war days (WW2 and Korea and Vietnam) and I see their physical maladies and I many times wonder why I am even there. I am reasonably fit (for now)… I am not in a wheel chair, I have no tubes attached to me, and I can’t even remember the last time I had a dream much less suffer from PTSD like these fellows; these guys have earned this care the hard way. I’m a relative newcomer to all this. I’ve fired my weapons but never in anger or toward an enemy… nor did any enemy have me in their sights. I am humbled being around these guys. But I am no less proud for having served my time during a period when so many loathed serving their country as a protest to the war. I did a good and honorable job, too… for four years. Yet I still thank the guys who experienced combat and gave so much. I left the military in January, 1975. 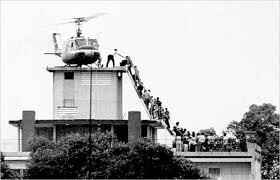 In May the war was over for the U.S.
Symbol of the fall of Saigon and the end of the war. When I was in the funeral business I made it a special point to treat the families of veterans in any special way I could. They deserved no less. Right now the veterans have the respect of a greatful nation… but it wasn’t always that way. We should make sure that part of history is never repeated. This entry was posted in Historical Boomer Reflections, Social Issues, Viet Nam and tagged Huntley-Brinkley Report, Middle East, NATO, South Vietnam, Vietnam, Vietnam War, Vietnamization, Walter Cronkite. Bookmark the permalink. I recently saw a comparison of “days under fire” for today’s infantry versus the three previous periods dating back to WW II. While I don’t recall the exact numbers , today it’s near 30 times the rate of previous conflicts. And sadly a significant number of these folks are guardsmen who used the guard as a means of financing an education. Which makes the ones who chose the student loan route and now fail to repay the loans all the more loathsome. Oh, BTW……..THANK YOU for your service! I think I understand you troublesome thoughts against a tragedy that hit so many people of your generation, but not you. It’s similar to the sense of ‘being guilty of something’ that sometimes hit survivors: you have not been hit by a tragedy tht hit so many people… but why? you were not ‘better of them’… and so you feel a little guilty, in a vicious manner you don’t understand completely. Try not to feel this way: you are not guilty of anything. Hope I wrote this clear, because english is not my first language. I wrote a book regarding the vietnam war, and I would really like you to be my guest and friend. You can download episode 1 inside my wordpress site. Thank you for your kind words and concern. I undererstand what you say about having some form of survivor guilt… but I am not really obsessed.. it’s just a feeling I get when I see veterans. I will read your book and let you know my feedback. Thanks for the opportunty! Very interesting! I roamed around your blog, and I like the way you think. I love all the history lessons from a personal point of view -someone who lived it. Thank you for gracing the blogging community with your presence and knowledge with the added humor. Thanks for your kind remarks. Gotta balance life somehow. Looking forward to reading your own blog.